(CN) – Growing e-commerce and internet use require secure networks to protect data and ensure privacy across the globe – objectives that are easier said than done. Traditional public-key cryptography – in which information is encrypted by the sender and decrypted by the receiver, protecting the given communication – generally relies on the perceived complexity of certain mathematical functions. By comparison, quantum-key distribution, or QKD, involves individual light quanta – a single photon – in quantum superposition states to guarantee unwavering security between widely dispersed parties. While quantum communication distance has so far been limited to a few hundred miles due to the channel loss of fibers or earthly free space, researchers have solved this limitation by exploiting satellite and space-based links, which they used to hold the first quantum-safe video conference Friday. 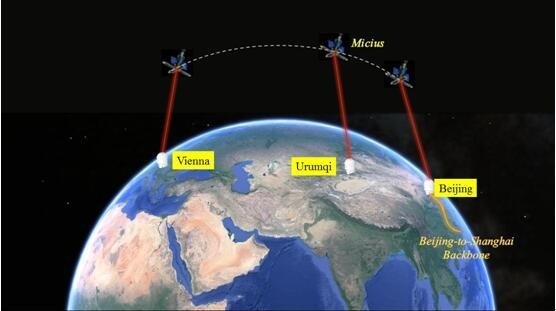 Led by Jian-Wei Pan, a scientist at the Chinese Academy of Sciences, the team spent more than a decade developing a sophisticated satellite known as Micius, which is dedicated to quantum science experiments. The satellite successfully launched in August 2016 from Jiuquan, China, orbiting at an altitude of about 310 miles. The satellite features three payloads: A quantum teleportation receiver and analyzer, an entangled-photon source and a decoy-state QKD transmitter. Five ground stations were built in China to interaction with Micius. Within a year of the launch, three milestones that will be vital to a global-scale quantum internet have been achieved. Among these accomplishments is a satellite-to-ground decoy-state QKD that maintains a kHz rate over a distance of roughly 745 miles. The other achievements include ground-to-satellite quantum teleportation and satellite-based entanglement distribution to two locations on Earth separated by about 745 miles. The effective link efficiencies in the satellite-based QKD were calculated to be approximately 20 orders of magnitude larger than direct transmission through optical fibers at the same distance. The team then combined the satellite-based QKD with metropolitan quantum networks, in which fibers are used to efficiently connect many users in a city with a distance scale of around 62 miles. For example, a station located in Xinglong has been connected to the metropolitan multi-node quantum network in Beijing using optical fibers. The largest fiber-based quantum communication backbone was built in China recently by Pan’s team, which linked Beijing to Shanghai – using 32 trustful relays – with a fiber length of about 1,240 miles. The backbone incorporates a decoy-state protocol QKD and achieves an all-pass secure key rate of 20 kilobytes per second. The system is being tested in real-world applications by insurance and securities companies, banks and governments. In a test of the versatility and robustness of Micius, QKD from the satellite to the Gras ground station near Vienna was carried out successfully this June. Similar experiments are planned between China and Italy, Singapore, Germany and Russia.